12.24.100 - Boat/watercraft launch permit. A. Permit Required. No person shall launch a boat or other watercraft or otherwise utilize any of the designated municipal owned and operated watercraft launch sites, nor shall any person park a boat trailer or other vehicle in the parking stalls located near the boat launch sites that have been designated specifically for vehicles with boat trailers, without having obtained the appropriate permit or sticker, paid the established fee, followed the procedures set forth on the application for such permit or sticker and properly affixed the permit or sticker to the parked vehicle or trailer. Any vehicle parked in the parking stalls near the boat launch sites designated for vehicles with boat trailers only shall have a permit or sticker for each and every day it is so parked. A one-day permit shall be in effect until twelve p.m. (midnight) on the date the permit was purchased. The permit shall apply only for the use of launching one watercraft. 1. Establishment of Boat/Watercraft Launching Fees. Launching fees shall be recommended by the parks committee and established by resolution of the Omro common council. The established fees will be kept on file in the office of the city administrator. 2. Payment of Launching Fees. Permit fees shall be paid on a daily or annual basis for the use of all city-owned and operated launching facilities. All requested daily permit application information and corresponding fees must be deposited into the proper collection receptacle provided at the launching sites. Annual permits may be obtained at Omro City Hall upon completion of the permit application form and receipt of the applicable fee. A second annual permit for the same owner of record of additional watercraft may be obtained for an additional minimal fee. 3. Daily Permits. Daily permits shall only be valid during the day of purchase. Such permits shall be displayed in the driver's side window of the motor vehicle used to launch the watercraft and shall remain on display for the entire time the vehicle is on the premises of the city launch site or until the watercraft is removed from the river if not parked on the premises of the city launch site. 4. Annual Permits. Annual permits shall be valid from March 1st of the issuing year to February 28th of the subsequent year. Annual permit stickers shall be prominently displayed on left-hand side of the trailer used to transport the watercraft to the launch site. If no trailer is used, the annual permit stickers should be placed on the back left bumper of the vehicle used to transport the watercraft to the launch site. 5. Exemptions. Exemption from payment of the watercraft launching fees may be granted for launching of certain authorized government watercraft or fire department water rescue vehicles with the express approval of the chief of police or the director of community services or designees thereof. B. Avoidance of Fees. No person or owner of a watercraft vehicle shall engage in any shift, scheme device or plan which results in payment of less than the actual permit fee due for any person launching a watercraft vehicle at a city-owned and operated watercraft launch facility. Violation of this section shall result in the issuance of a ticket and/or citation and applicable fines from the Omro police department. C. Responsibility of Owner. If any watercraft vehicle violates any section of the Omro Municipal Code and the operator of the vehicle cannot be determined, then the owner or person in whose name such transport vehicle or trailer is registered is held prima facie responsible for such violation. D. Penalties. The penalty for violation of any provision of this section, and related resolutions or sections, shall be a forfeiture of monies for fines and court assessments as established by the Omro police department under the authority of the state of Wisconsin. 1. The enforcement of this section shall fall under the jurisdiction of the Omro police department. For the purpose of enforcing this chapter, the director of community services, or designees thereof, shall summons the Omro police department to issue citations for violation of this section. 2. Issuance of Tickets. Law enforcement officers observing violations of the restrictions specified within this chapter may issue citations or tickets, which shall be attached to the vehicle in violation. Each ticket shall specify the violation of this chapter, the location of the vehicle in violation, the license or registration number of the vehicle in violation, the state of registration of the vehicle in violation, the time of violation of the provisions of this section and any other facts or knowledge of which is necessary to an understanding of the circumstances attending to the violation of this section. F. Alternate Procedure. In lieu of the foregoing provisions, a person who has been issued a citation for violation of this section may request a hearing regarding such violation. The person shall be issued a citation or summons and such proceedings shall thereafter be governed by Sections 345.34 to 345.47 of the Wisconsin Statutes. G. Revenue. All revenues derived from launch fees shall be designated within the general fund and used strictly to fund operational expenses for the launch site facilities and repairs to boat launch facilities upon the guidance and authorization of the director of community services. Use of these designated revenue funds for repairs or capital improvements to the boat launch sites other water based facilities will require the recommendation of the parks committee and approval of the Omro common council. Use of these designated revenue funds for any other parks capital improvements or repairs will require the recommendation of the parks committee and the approval of the Omro common council. All unused boat launch revenues at the end of the calendar year will automatically roll over into the next year's budget for parks capital improvements upon the final authorization of the Omro city council and shall continue to be designated and used strictly for such expenses as described above. 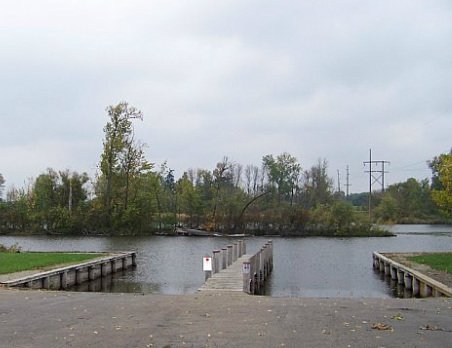 There are three boat launches that are available for use with the Omro Boat Launch Permit. Where to get a boat launch permit.